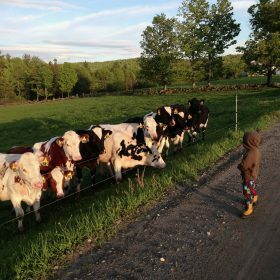 The Bootstrap writers were asked this month to write about the breed choices their farms made, their personal preferences, and how they’d like to see the herd evolve in the future. One of Organic Valley’s staff vets is fond of sayi ng, “there’s just nothing like black and white on green. I just love seeing a field of black and white on green.” And he’s referring to the Holsteins. The cow that I would say has come to represent the traditional image of a dairy cow. We have a herd of primarily Holsteins. They’re good cows. They’re not too smart. They’re relatively efficient converters of forage into milk and they breed and produce very well. They also have the potential to be really really big. Not only can this be problematic because the efficiency of production is lost when you’re dealing with a big animal, but they can also be more than a little intimidating to deal with! We also have Jersey crosses: half or three-quarter Jersey/Holsteins that are the cutest fluffiest smooshiest baby faces. And I just love them. They are efficient little conversion machines that for a small intake will produce rich creamy milk high in butterfat and protein. They are great pasture cows. However, they are also a giant pain in the neck: they can smell a hole in a fence a mile away, they’re quite smart, pushy, and milking them can be challenging as they are smaller than the average Holstein and therefore have more shenanigan room in the milking parlor. I don’t really care – I love them. I think they have a ton more personality and I always feel more connected to our Jerseys than the Holsteins. Dad is the opposite. He would cheerfully only have Holsteins. Jerseys can be tricky as well because they hide illness until it’s at a point where they are truly sick. When you’re managing a holistic dairy operation that can prove challenging. For kicks, Dad breeds in red Holsteins as well. They’re his novelty. They are fantastic producers, but a tend to run a bit large for my tastes. Jersey/red Holstein crosses though? Super adorable beasties. As I read by way of explanation in The Dirty Life, conventional dairies went towards Holsteins since when they are fed well they will produce pounds and pounds of milk. A herdsman would then add in a few Jerseys to balance out the milk profile, as Holsteins don’t produce overly rich milk, the proteins and butterfat aren’t as high. And you need all that you can get to make any money in the conventional dairy world. 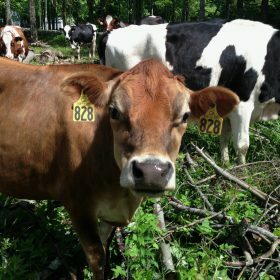 In an organic production system, though, the push is towards quality not quantity and a combined herd of Jerseys and Holsteins satisfies that nicely for us. Were it entirely up to me, I would breed in more Jerseys. But for now we compromise and are working to ensure that we keep some Jerseys in the mix and that the Holsteins we breed are bred to be small. Larger animals simply require more feed. In terms of efficiency, the smaller Holsteins require far less feed than a large one and still produce a good amount of milk. And the bonus? I’m not as intimidated by them! People always seem a bit shocked that the only animals we raise here are cows. (And a cat.) It is my hope to add chickens into the mix, but that must remain a project for another year. For now, we keep plenty busy maintaining the girls we have. 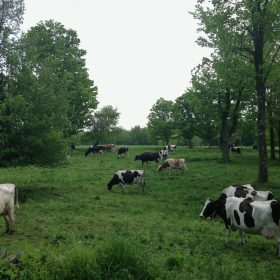 Thanks to Stonyfield, Profits for the Planet, for funding the 2013 Bootstrap blog series.